Prof Subrat Kar of IIT Delhi who is a part of the Ulster University team visiting Kalimpong in early Mar2016 was with us for 3 days to reccee landslide areas of Darjeeling district in advance and to report back to the team. 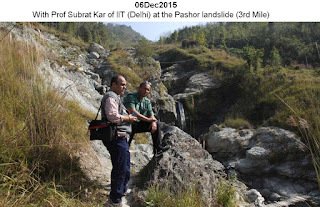 We showed him most of the landslide areas around Kalimpong town and also Balasun landslides in Kurseong. The Integrated Mountain Initiative held its annual Meet of the Mountain States in New Delhi on 11 December 2015 celebrating International Mountain Day, at the VishwaYuvak Kendra, Chanakyapuri. 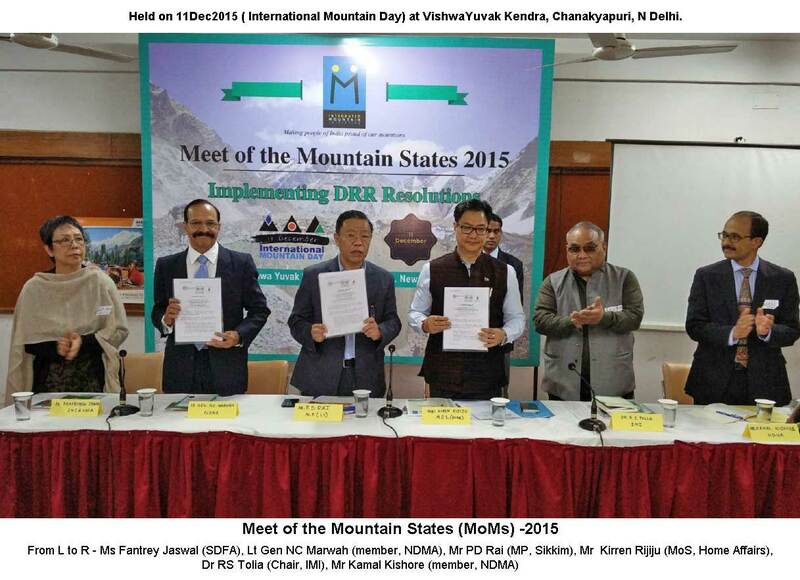 The Meet followed up on the successful conclusion of the 4th Sustainable Mountain Development Summit held in Itanagar, Arunachal Pradesh in October 2015. The central theme of the Summit was Disaster Risk Reduction, which is particularly crucial for the mountains which face increasingly frequent large- and small-scale disasters such as earthquakes, flash-floods, and landslides. Natural disasters result in loss of lives, and set back the economy of the region by destroying assets, interrupting school education and livelihoods. To follow up the recommendations made during the Summit, the Meet of the Mountain States was held in the format of a workshop which discussed the implementation of these resolutions, by identifying the implementing bodies, liaison mechanism, resources required, and timelines. The Meet was attended by Lt Gen Marwah and Dr Kamal Kishore, Members of the NDMA, as well as representatives from the NDRF, the State and Disaster Management Authorities from Sikkim, Uttarakhand, and Himachal Pradesh. Grassroots organizations working on disasters on the ground, All India Disaster Mitigation Institute, Delhi and SaveTheHills, Kalimpong participated. The Chief Guest, Mr KirenRijiu, Hon’ble Minister of State for Home Affairs, recently declared the Champion of DRR for the Asia-Pacific region by the United Nations, gave rousing address espousing his concern about disasters and offering his full support for mitigation and preparedness measures. Mr PD Rai Member of Parliament (Lok Sabha) Sikkim updated the gathering about his participation at the UNFCC COP 21 in Paris, particularly the keen interest in supporting measures for disaster risk reduction in mountain states shown by Margareta Walhstrom, Special Representative of the Secretary-General of the UN for Disaster Risk Reduction. IMI is a collective initiative of a wide range of stakeholders from across the Indian mountain states, who gather together to deliberate and advocate mountain-centric development policy. 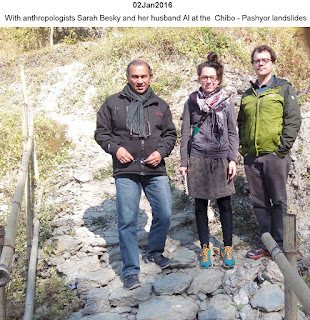 Prof Sarah Besky, an anthropologist and author from Brown University and her husband Al (also an anthropologist) were in Kalimpong for a day to learn more about STH activities and also to do field work on landslides. 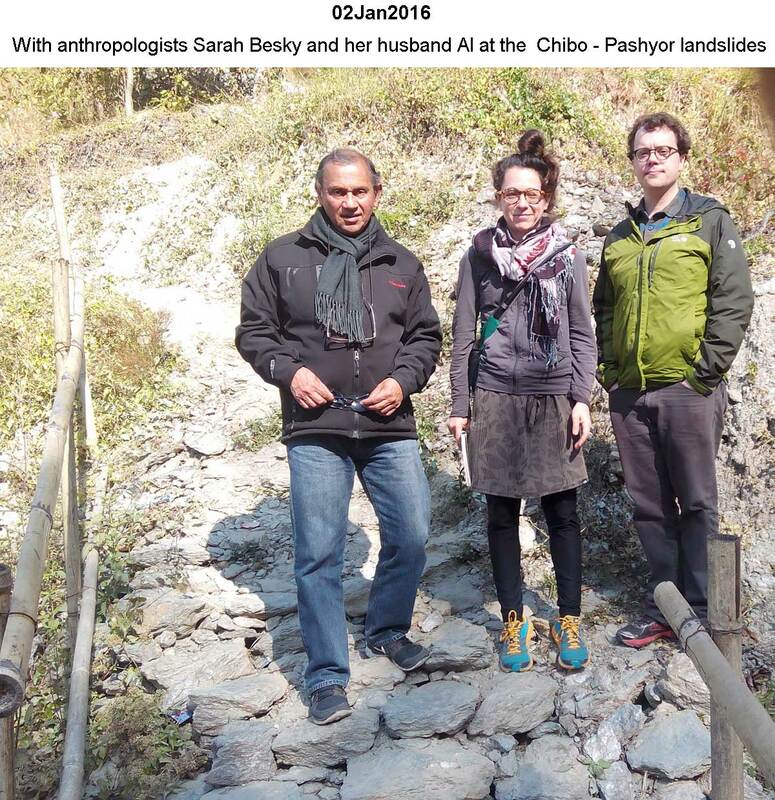 Spent much of the day discussing impact of landslides in the Darjeeling-Sikkim Himalaya and also went out for field work on the western and easterns faces of the Kalimpong ridge. 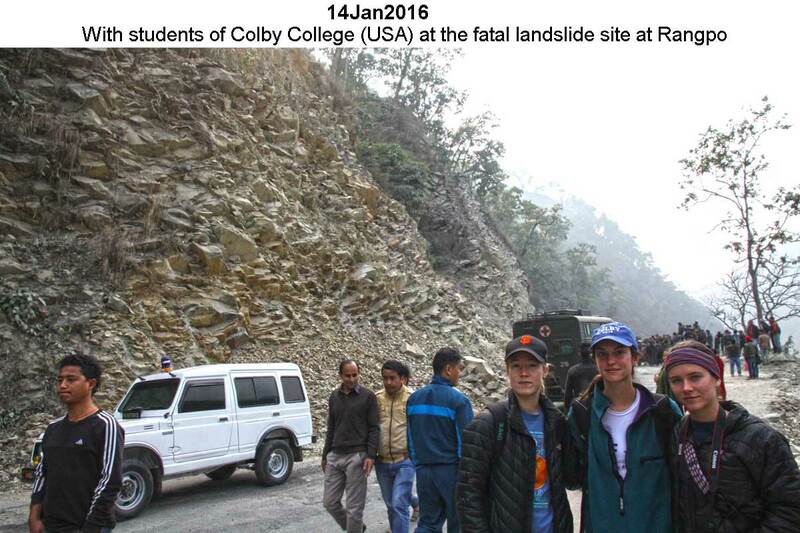 3 Gap students from Colby College (USA) were with us for 3 days on environmental /landslide hazard studies. While they were here the horrible fatal landslide occurred at Rangpo. We were able to see first hand the impact on the unfortunate victims and the community at large.